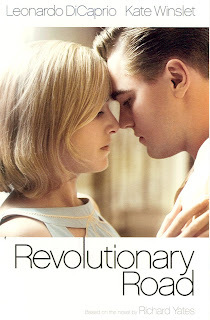 After Kate Winslet won the Best Actress Award at the Golden Globes the other night, I was interested to see the film Revolutionary Road in order to check out her performance. Actually, I had seen a trailer for the film but it looked -- um, shall we say, less than riveting. It turns out the trailer really told almost everything you need to know about the film. Kate Winslet to Sam Mendes (her husband and the director): "But, just what, exactly, is my character's motivation?" Sam Mendes: "Well, Kate, she's actually just really, really bored." Kate W. : "I see." Exhilarating stuff, I'm sure you'll agree. I know that being a housewife in the 1950s was not a bed of roses in terms of social freedom or personal development. I'm also sure that April was suffering from depression and she did exhibit bipolar tendencies (manically planning new things, only to fall into a funk when things don't pan out). Still, her whining and carrying on about how miserable she is quickly wears thin. I would never wish ill on anyone, but since these are fictional characters, here goes: a child abduction, house fire, or bout with cancer would have given these people something to whine about. The dialogue and delivery were also somewhat odd. I guess they were going for the "50s feel" in imitating the style of films from that era, but it sounded unnatural and painful to modern ears. One of the things uttered by April (early on, before terminal malaise set in) was so cringe-inducing that I had to rummage in the dark theater for a pen to write it down: "You're the most beautiful and wonderful thing in the world. You're a man." EEEEEWWWWW! Another annoying thing (while I'm on a roll) was the fact that neither Kate Winslet nor Leonardo DiCaprio could begin any big dramatic scene without pausing for a cigarette. Hardly anyone else in the film smoked (although I know smoking was much more common then than it is now), but April and Frank were always stopping to fumble with cigarettes and lighters. WHY was so much screen time taken in lighting up? It added absolutely nothing to the story (other than serving to annoy me). Is Hollywood getting kickbacks from the tobacco industry to try to convince us all that smoking is still cool? I don't get it. The only thing that made this film even marginally interesting was the outstanding performance by Michael Shannon as the mentally ill son of the Wheelers' real estate agent, played by Kathy Bates. Shannon's character, John Givings, is brought to the Wheeler house by his mother while he's out on a 4 hour pass from the asylum. He is the only character who is brave enough (or disturbed enough) to say what he really feels. He sees through polite social convention and cuts immediately to the heart of every situation. At first, the Wheelers find his brutal honesty refreshing, but before long they react to his "home truths" with anger, shock and horror. I know everyone says Heath Ledger has the Best Supporting Actor Oscar wrapped up this year, but I sincerely hope Michael Shannon receives a nomination. His performance was one of the best and most memorable I've seen in years. The other interesting thing about this film was the clothes. It was "all linen all the time" and nary a wrinkle in sight. April might have been spectacularly bored, but by god, that woman could work an iron (the starch budget alone on this film must have been astronomical). O.k., well it was between Rev. Road and Defiance for this weekend and I think you just helped me make up my mind. I'll wait for the DVD. Thanks! I'll be interested to hear what you think of it when you get to see it! Hope you are well and that you enjoyed your snow day! Hi Jennifer! I know, I'm not a big Leo D. fan at any time, but Kate Winslet is usually good. Must be the combination, as you say, that spelled doom for this project!